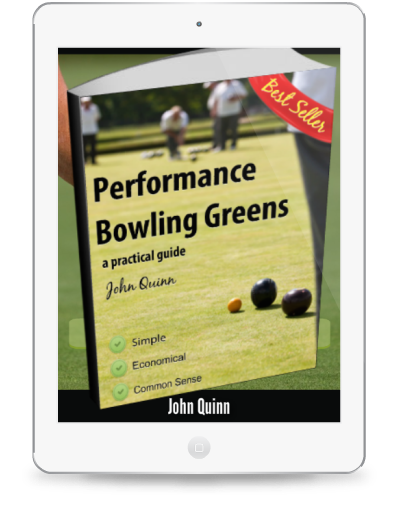 The plant available water in bowling greens is determined by the physical characteristics of the soil. Most importantly the soil texture dictates the relative percentages of Macro, Meso and Micro pore space in the soil. This soil porosity also dictates the rate at which the green will drain. 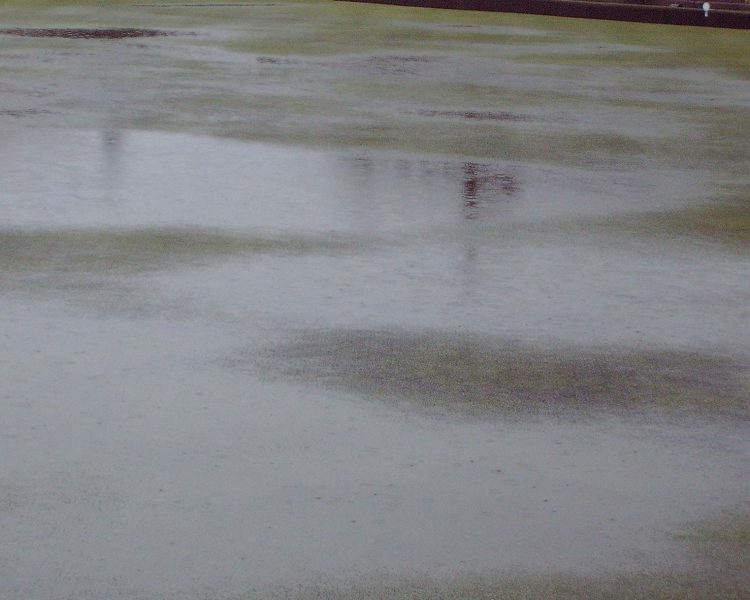 The balance between drainage and plant available water is one of the most critical components of a performance bowling green maintenance program. Here then is the very crux of all those arguments about top-dressing! Answer: a lot less for a performance bowling green than one in the throes of a traditional maintenance program. It surprises me that clubs are surprised at the little surprises they get when the water bill comes in. How can you be surprised that you used more water this year when you added 5 or 10 tonnes of sand to the green last autumn? Many greens are already unmanageable in a normal (UK) summer due to excessive water requirements, localised dry patch and impermeable thatch; in a drought scenario its unlikely that there is any amount of water that would suffice. 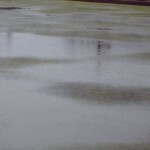 This is because most of the water applied to poorly maintained greens is wasted to evaporation, run off and/or leaching. Thick thatch holds water at the surface like a sponge, until of course LDP sets in, then it becomes akin to concrete and most water is lost to run off. LDP causes soil particles to become hydrophobic, shedding any water that gets through the thatch to the macro-pores in the soil and away to the drains. Performance greens can be watered cheaply and effectively because they only need enough to keep them alive during prolonged dry periods and can mostly take care of themselves in the normal course of a British Summer. In many cases there is no need for anything more sophisticated than a large holding tank (the bigger the better) a simple pump and a 19mm hose to hand water hot spots on the green. This is much more effective than pop up sprinklers. Water requirements and routines are given in more detail here. Yes I’ve come over all Latin today; and no, it’s not because I can’t believe my old jeep sailed through its MOT yet again last week! Even the garage owner was amazed that he couldn’t find anything wrong with it. No, the Latin was inspired by a photo I received from a regular reader who sent it in to illustrate a problem he had on his green with red-thread. However, the reason for this post is not to discuss Latin, or Red-Thread for that matter. The clump of grass in the centre of the photo is annual meadow grass, or Poa annua to use its botanic name. It’s not that we greenkeepers are more cultured than the average man in the street, more to do with college lecturers who insisted that we learned to identify and remember the botanic names for hundreds of grasses, trees, shrubs and weeds. Back to the clump of meadow grass. This is actually a weed ( an unwanted plant in its current state and location) as we are really trying to create and maintain a sward of finer fescue and bent grasses for the best bowling surfaces. Unfortunately, almost (probably all) all of the bowling greens in the UK will be infested with this grass. Even newly built greens constructed on sterile rootzone material will show signs of this weed within 2 years as its seed blows in from the surrounding area. From the picture you can see it at its worst aesthetically, which it usually is at this time of year. Right through May and June it will show up as unsightly clumps of lime green grass which contrasts vividly with the other darker green species. Also at this time it will be seeding like mad. The visual problem recedes as the summer progresses, but it does actually produce seed all year round. Scarifying, verti-cutting and close mowing are of minimal value in removing the seed heads and to some extent can actually help annual meadow grass to thrive in the summer. This is because it has a very low and prostrate growth habit which keeps the majority of the plant including seed heads below the cutting blades. Excessive scarification and verti-cutting can actually weaken the finer fescue grass leaving the annual meadow grass with a stronger chance of survival. It does have one Achilles heel and that is water. Poa annua is a very shallow rooting grass and the Performance Greens program is designed to allow greenkeepers to keep the surface of their greens a little drier than most, thus putting the weed grass under pressure. This is achieved by managing irrigation to ensure that the green is watered deeply, but irregularly which also has the effect of encouraging deeper rooting of the finer, desirable grasses. The program also calls for a more sensible approach to cutting heights, whilst using other methods to achieve green speed. This allows the finer grasses to put down even deeper roots and also strengthens plants against drought and wear. Poa annua is however likely to be with us ad infinitum as it is a very adaptable grass. This adaptability is actually a good thing in the end as over time the grass becomes finer and blends in more readily with the finer grasses. 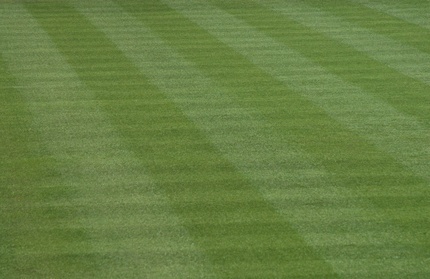 It is perfectly feasible still, however, to have a green that is predominantly fine and to keep Poa annua under control over the long term by following a sensible program that encourages the development of a healthy living soil which in turn will support a strong and dense sward of finer grass. 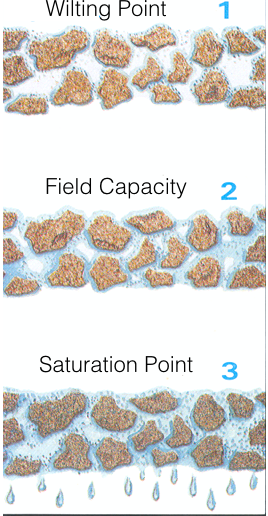 Localised Dry Patch (LDP) is a condition that causes turf to become hydrophobic (water repellent). Once LDP has taken hold, irrigation simply causes the unaffected areas to get lusher while the LDP affected areas get drier. This exacerbates the problem making the green increasingly frustrating to play on. Soil sampling will reveal powder dry soil. Unsightly brown patches of turf start to spread over most of the green. The turf on these areas recedes causing a bumpy surface and in most cases the weakened grass will be taken over by moss. But what can be done to cure the problem? Research shows that fungi can contribute to the onset of this problem. Fungal mycelium may coat individual soil particles making it impossible for water to adhere to them. 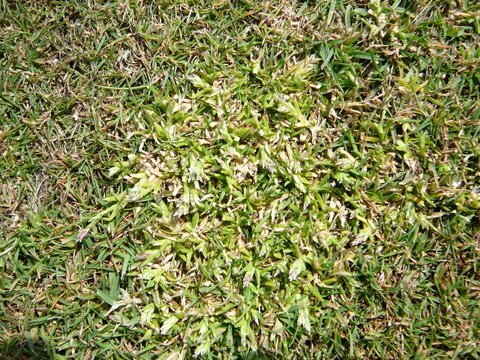 Thatch control and irrigation management are the two most critical factors in the management of this problem. By the time the problem is visually evident it is already too late to achieve an effective cure. 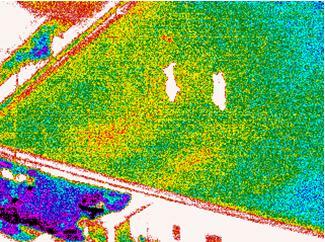 This is because the problem is inherent in the green and usually only becomes visible at the height of the season. Irrigation management requires an understanding of Water Balance in the soil and this is detailed in Performance Bowling Greens. 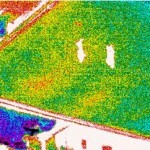 Just look at the infra-red thermographic image on the left, it shows an infrared image of a bowling green. The red areas show the extra heat that is being kicked out by the LDP affected areas, and that is directly related to the lack of moisture retained in the soil in these areas. In the standard photo, the LDP is barely noticeable at this stage, but will get steadily worse. Frequently we are now seeing that areas affected by dry patch disorders have suffered a complete depletion of moisture and that the soil structure has failed, turning to powder. Traditional wetting agents have sought to address dry patch from a very limited viewpoint, namely the reduction of water surface tension making it easier for water to be attracted and held around individual soil particles. Although Wetting Agents can be used to good effect on LDP once dry patch has progressed to what we call breaking point, no amount of simple surfactant wetting agent will help it re-wet sufficiently to ensure a full recovery of the turf with full grass cover. 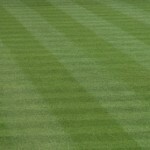 Typically the manager has to wait for the turf to over-winter before full grass cover is returned. This makes it all the more critical that we ensure that the products we use are effective in both results and cost. As LDP is a disorder within the soil it is important to keep one eye on re-wetting and one on re-building the soil’s health. This can best be achieved by ensuring that you use a wetting agent product which can supply carbohydrates to the soil in addition to their soil re-wetting properties. The addition of a high volume of Carbohydrates ensures that the products also contribute to the maintenance of soil structure while helping stressed grass plants hang on to life for longer while the soil is re-wetting. 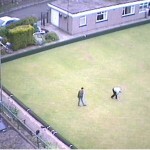 Excessive use of sand on bowling greens over the years has been the single biggest influence on the occurrence of LDP. More on the causes and management of LDP here.